Located in the main building, these rooms feature modern décor. Please note that there is an age limit of between 16 and 35 years. Basic, yet modern room with shared bathroom facilities. Please note that there is an age limit of up to 45 years. Includes a bed in a mixed dormitory room. Shared bathroom facilities are located in the hallway. Please note that there is an age limit of between 16 and 35 years. Basic room with 1 triple bunk bed. Shared bathroom facilities are located in the hallway. Please note that there is an age limit of up to 45 years. Basic room with access to shared bathroom facilities in the hallway. Please note that there is an age limit of up to 45 years. 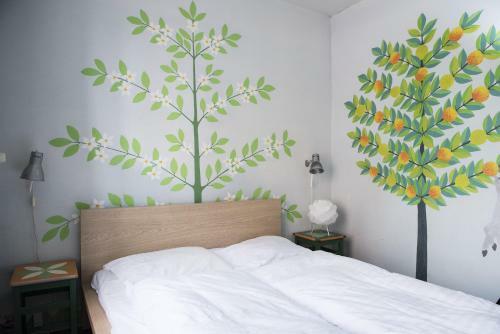 Set in Nørrebro, this 24-hour youth hostel is 2 km from Copenhagen Central Station and Tivoli Gardens. It offers a beer garden and free Wi-Fi, internet computers, lockers and a luggage room. Both private and dorm-style rooms are provided at Sleep in Heaven. Bed linen is included. Free walking tours, city maps and a pool table are offered at Sleep in Heaven. Bicycle rentals can also be arranged. A daily happy hour takes place in the bar or beer garden. Sleep in Heaven is a 4-minute walk from the Griffenfeldtsgade Bus Station and 10 minutes' walk from Forum Metro Station. Sleep in Heaven has an age limit of between 16 and 35 for dorm rooms and up to 45 for private rooms. The maximum length of stay is 7 nights. Consecutive weekly stays are not possible. Sleep in Heaven does not accept groups of 7 or more guests. At Sleep in Heaven, there is a 4% charge when you pay with a credit card. Tende nelle stanze da letto che sono a metà finestra quindi chi è nel terzo letto in alto alla mattina luce negli occhi, basterebbe semplicmente alzarle perche sono lunge abbastanza. lI cuscino praticamente è come non averlo, inoltre assenza di cucina, peccato perchè mangiar fuori a copenaghen costa davvero tanto. Inaccettabile colazione da 7 euro e the in busta piu di 1,50 euro. biliardo che la pallina bianca non scende mai quindi ogni volta bisognava chiamare la reception per sbloccarlo. Da migliorare le prese nelle stanze. Awesome hostel, nice peoples, quite, not far from metro station and bus station. Really wery clean! I didn't see the clean like this even in many expensive hotels. Reception 24/7, i didn't have crones - they take payement by euro. So i highly recomended this hostel!!! Staff were superb, incredibly nice and helpful. Walls and windows are pretty thin, dont expect a silent sleep. Staff molto cordiale e sempre disponibile. Wifi veloce ovunque. Posizione non centrale, ma comoda per raggiungere tutti i luoghi d'interesse. Pulizia pessima sia bei bagni che nelle camere. Bien pour les jeunes ! Plenty of space on the leaving room. Has a nice garden where to seat if there's good weather. The team was nice and helpful. Hairdryer on the toilet if you need. There are not towels.. Make sure you bring your own. There isn't kitchen -whilst most of hostels where I've being did! Bra system med skåp att det var det kortet som var nyckel till dörren som var nyckel till sitt skåp. Sehr modernes Sicherheitssystem, großer Aufenthaltsraum, ruhige Lage (Altstadt aber auch zu Fuß gut erreichbar), Duschen/WC modern und sehr sauber. Mi è piaciuto molto lo staff, molto giovanile e disponibile per qualsiasi dubbio. Molto bella l'area comune, dove puoi passare del tempo, seduto sulle poltrone a fare due chiacchiere o passare del tempo, leggendo un libro o navigare su internet con il wifi free, dopo una lunga giornata di camminate esplorative per la città. Molto buona la posizione (noi a piedi, in 20 minuti, arrivavamo in zona Tivoli - stazione centrale). Camere troppo piccole per il numero di ospiti (camera con due letti a castello da tre) in cui non riuscivi a girarti e con poche prese elettriche. I bagni e le docce sono in comune, ed anche li, ce ne fossero stati di più, non sarebbe stato male. Prezzo della colazione un po' cara. Girando per supermercati e bar, riuscivi a farti una colazione low cost, da solo. Noi per esempio, compravamo latte e paste in un supermercato, e ci piazzavamo in un parco adiacente, ed oltre alla colazione, ci gustavamo anche un ottimo panorama. В нашем номере были клопы!! A localização não é má e está num bairro muito agradável. As chaves dos quartos são cartões e cada pessoa tem direito a um cacifo que abre com esse cartão. Smelly bathrooms; dark and no ventilation. Room was quite loud from outside traffic. The property is amazing. It's not on the city center, but it's really close to a bus stop, metro station and a really cheap super market. The whole place is clean and cozy. But the part of it, from far, was the staff. They're all so polite, so helpfull, they give a new meaning to the word "welcome". One of the best hostels I've ever been. I am so satisfied with the service. We get an excellent treatment specially with Elisa who was very close and kind. They changed our reserves in the last day with no extra cost when they didn't have to cause it was our mistake. We missed the happy hour but I think it's worthy. We are sure of repeating next time!